The Playpump looks like a piece of playground equipment, but it's really a disguised pump for getting water out of the ground. As kids play on it, water is pumped to a nearby tank. 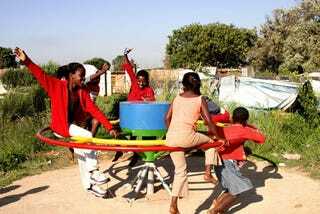 While it's being used, the Playpump brings up 1,400 liters of water per hour, which isn't too shabby. There's a tank between the pump and the faucet, allowing water to be stored if no one is using it. The only trick is convincing kids that running around and spinning this wheel is fun playtime, not work.